Over the years Paul Prem Nadama has been a front man of many top function bands. Gigs include The Roadhouse Covent Garden, Walkabout Bars and many corporate or (BBC, Thames TV, Royal Television Society). He was also singer-guitarist with World Music band ‘Mundo Pequeno’, playing at many festivals, often singing in Spanish. He is also an accomplished drummer/percussionist, going back to his early band days! Paul has shared a stage with world-famous soul outfit the ‘Commitments’, and in 2004 spontaneously accompanied pop diva Katrina at a festival with her smash hit ‘Walking on Sunshine’! Wednesday, February 27th: Cafe AlteArte, Altea Spain! – An informal evening of originals and covers in a delightful intimate venue on Costa Blanca. 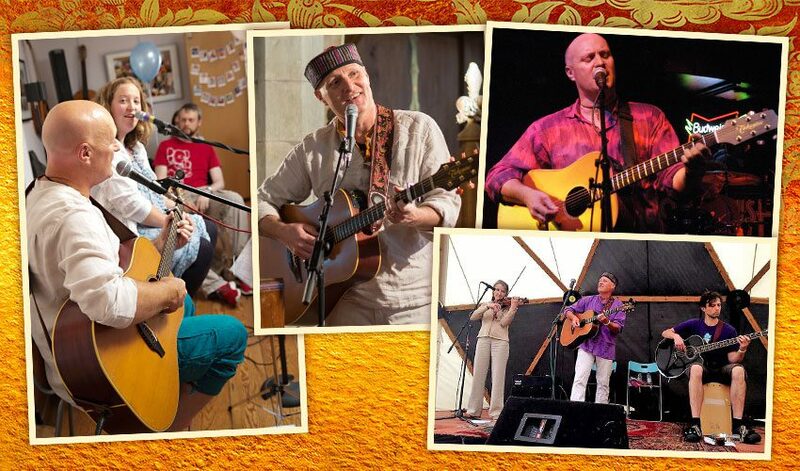 – Mantra Movie Screening with a ‘live’ Mantra-singing session from Paul afterwards. Friday, March 29th: Hopyard, Forest Row, East Sussex. – Half-hour set of originals as support for top Irish artist Kal Lavelle.